The ease of set-up, powerful web interface and Modbus TCP support were other determining factors. The end-user was using a vision system for analyzing mineral fragmentation on a conveyor line. The mineral would be broken down and sent along the line where the vision system would ensure the particle size was correct. However, problems exist with picking up accurate readings when the bed depth, or amount of mineral on the line, is great. 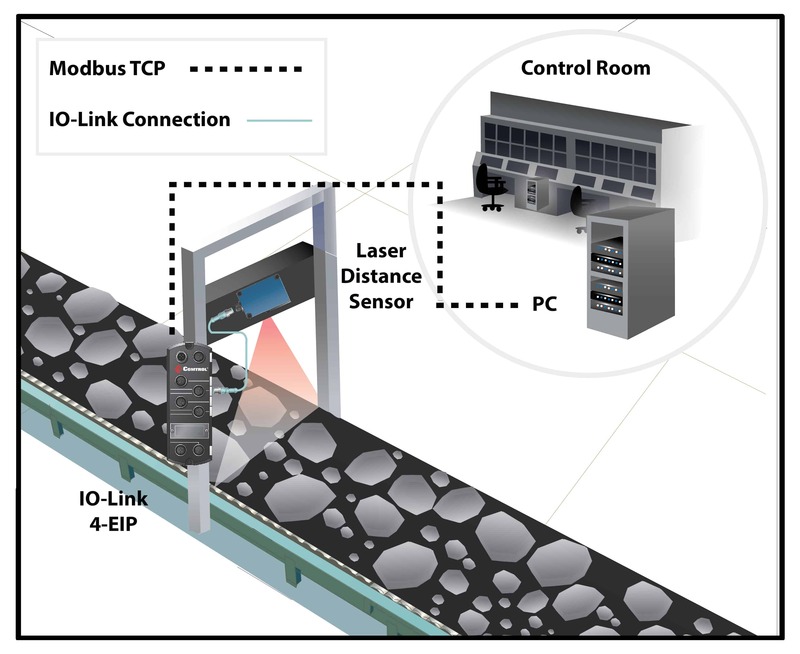 Working with Comtrol’s IO-Link Master that is used to connect the IO-Link distance sensor has helped the company increase their accuracy with reading the bed depth. The laser distance sensor is also used to pick up the distance to the top layer of mineral going down the line which helps normalize the data along with the vision system. This improves accuracy in analyzing mineral particle sizes as the line moves along. Another issue that the company was facing when they had their conveyor line jam, was that no one was notified until someone visually saw it. By utilizing the Comtrol IO-Link Master 4-EIP, it sends the data to a PC running custom software using a Modbus TCP driver. The software takes in the data and would contribute to setting off an alarm if a steady reading was displayed which would mean there is a jam in the line. In the end, this application helped prove that Comtrol’s IO-Link master is a superior solution that can be used in all kinds of projects, including those without a PLC or another controller. For those applications that do have a PLC, HMI, OPC or SCADA, Comtrol’s master works with multiple industrial Ethernet protocols and offers MultiLink™ which allows the user to communicate to two different protocols simultaneously. To learn more about IO-Link applications, please contact Brandon Roy.